Domini 1696. These (22) Actions are agreed: William Offoot against Thomas Date - trespass on the Case. "ITEM: All the rest, residue and remainder of my estate both real and personal - whether in England, Maryland or elsewhere I give and bequeath the same, after my wife shall have deducted and received her third part of the same to my sons Samuel, Nathaniel, Thomas and to my daughter Jane." Many alternate spellings of Offord are linked to one of the Norman nobles at the Battle of Hastings, all sharing a common root. Many of the spellings of Offord include; Offorde, Offorth, Offoot, Offott, Offutt, Uffitt, Ufford, Offworth, Offwurth, and Offwood. It was not uncommon for a person to born with one spelling, married with another, and buried with a headstone which showed another. Even during the time of Thomas Jefferson, spelling was by no means given the importance which we give it today as the pronunciation was the greater factor. Thomas Jefferson himself stated, "I have nothing but contempt for anyone who can spell a word only one way." 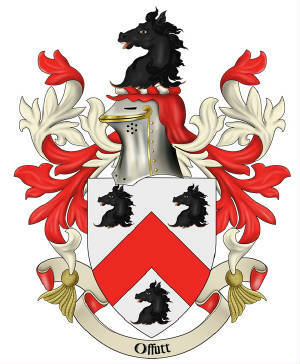 The ancestors of the Offutt family are descended from the Norman race. 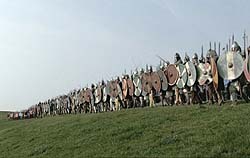 While the Normans are commonly believed to be of French origin, in fact, the Normans were Vikings in France. The Vikings under their Jarl, Thorfinn Rollo, invaded France in 911 A.D. Rollo laid siege to Paris and the French King, Charles the Simple, conceded defeat, granting Northern France to Rollo. 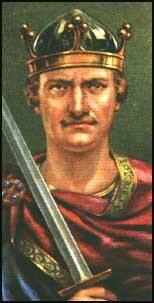 Rollo became the first Duke of Normandy. By the time the "Battle of Hastings" took place in 1066, the Normans had adopted the French language and culture. William, Duke of Normandy, who invaded and defeated England in 1066 was descended from Rollo. The surname Offord is found in the Domesday Book which was a census of England taken in 1086 by William the Conqueror, Duke of Normandy. 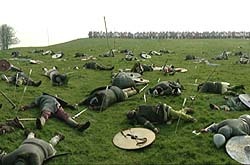 After the Battle of Hastings in 1066, William, Duke of Normandy, having prevailed over King Harold II, granted most of Britain to his many victorious Barons and became King of England, ending forever the reign of the anglo saxon Kings. He granted lands to his sons, nephews, and other members of his family and they became known as the under-tenants. French became the language of the English court. They brought the Norman system of surnames and heraldry from Northern France, to Britain, which identified the under tenant with his holdings in order to distinguish him from the senior stem of the family. Therefore the surname is descended from the tenant of the lands of Offord Cluny, held by Odo from Eustace the Sheriff who was a Norman noble and half brother to William, having been recorded in the Domesday Book census of 1086. A family name capable of being traced back to this document, or to the Battle of Hastings, is a mark of honor and distinction even to this day in England. The distinguished surname Offutt, being derived from Offord is therefore a place name which can be found in Huntingdonshire, Warwickshire, and Suffolk. The family spread out across the British isles over time accounting for later records in Wales, London and central England, as well as Scotland. Offord emerged as a notable English family name in the county of Huntingdon where they were anciently seated at Offord in the parish of Ely. Robert de Offeworth held the family estate in 1221, Edeline succeeded to the estates in 1273, and Robert de Offord, in 1327. 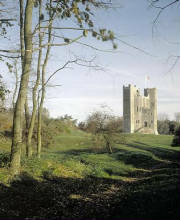 Robert de Offord, The Earl of Suffolk, was granted an estate which is now known as Orford Castle. The Offord’s contributed much to the politics of England and Scotland. During the 12th century many Norman families moved north to Scotland, following the Earl David of Huntingdon who would become King of Scotland. During the 17th century, England and Scotland were ravaged by religious conflict and many were transported to the new world against their will, others chose to move to a new land which might bring a brighter future through land acquisition. Settlers in Ireland became known as the “Adventurers for Land in Ireland.” They chose to keep the protestant faith and were granted lands previously owned by the Irish. The Offord name may have arrived in Ireland with the “Cromwelliam Adventurers for Land” in the 17th century. In 17th century North America, immigrants who shared the family name included James Offord, whose name was recorded as James Offwood in Maryland; Thomas Offord, whose name was spelled Uffitt on the shipping records of the "Lyon," and who's fathers name was previously spelled "Offott"; and William Offord, who's name is also spelled "Offoot" in the "Court Records of Prince George's County Maryland," Ophett in Presbyterian Church records, as well as Ofett, and Offett on probate records, and Offutt on his last will and testament (1732). William and Mary had eleven children. William died in Prince George's County, Maryland on June 10, 1734. Large tracts of land were willed to family members under the "Offutt" spelling. Those who inherited land also had their names recorded as "Offutt" and had no choice but to affirm their identity as such.